The user interface is a very important component of Digital Media devices, services and applications. The sleek user interface offered by Apple products is quoted as a key element for their success. Recently user interfaces have evolved in two main directions: inclusion of more media types such as audio, video, 2D/3D graphics and rich media functionalities, and aggregating small dedicated applications called Widgets to create effective and user friendly interfaces. The “atomic” nature of widgets promises users homogeneous and unified experiences when they interact with their heterogeneous devices such as desktop computers, mobile devices, home appliances, TVs, STBs, tablets etc. Mobility across devices while maintaining the state of the widget. A definition of MPEG-U widget is “a self-contained computer code within a Rich Media User Interface endowed with extensive communication capabilities”. 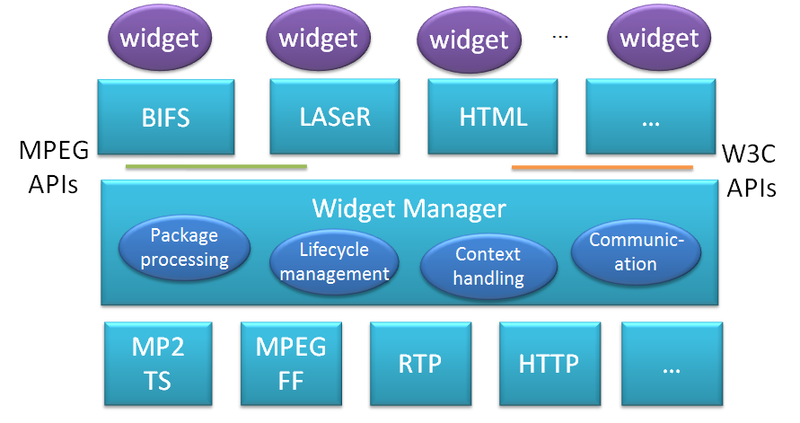 Widgets can be processed by entities running on different devices, called Widget Managers, in charge of managing the life cycle of the widgets supporting communications with other entities locally or remotely deployed and enabling widget mobility across devices. 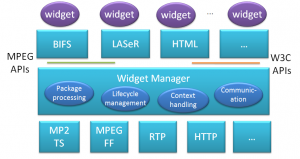 MPEG-U specifies normative interfaces between Widgets and Widget Managers, to allow Widgets from different service providers to run, communicate and be transferred within a unique framework.